Cuba is not an impossible dream for Americans. Hundreds of thousands Americans are visiting Cuba these years. Cuba is a friendly, welcoming country and despite the long embargo the U.S. has had against Cuba, there is no animosity what so ever from Cubans towards Americans. Traveling to Cuba was eased by the Obama administration bettered relations, however, there is still a tourist travel embargo in place. However the U.S. government has not been enforcing it, and has not done so for nearly a decade - in spite of various declarations made by President Trump. Please mail us for the full OFAC document. 1. Joining one of the licensed people to people tours from the U.S. Which means going on standard package a tour with a group and a 24/7 tour guide and following a predetermined program that one can never stray from and which do not allow for some beach relaxation or other private activity. These licensed tours usually cost between $3000 and $5000 per person per week (2016 prices). 2. Booking with an independent organizer. Choosing freely between hotel or casa particular, going on tours hand picked by yourself, basically seeing the Cuba you choose to see. There are various organizers for independent U.S. tourists, usually based in Canada, Europe or on site in Havana. With us, such a tour can be tailormade AND is considerably cheaper. All pre-trip payments made with non U.S. affiliated processors - usually European based. Cuba welcomes American tourists with open arms. There is not the slightest trace of hostility towards Americans among the Cuban population, if anything they are eager to talk to and get to know Americans. They see the old dispute between Cuba and USA as an issue between the governments of the two countries, not as an issue between the people of the two countries. Most U.S. citizens are overwhelmed by the reception they receive in Cuba and amazed that there is a country so different from their own so close by. Cuba and USA are indeed two very different planets, and it's a life changing experience for many Americans to visit the island. But Americans also need to realize that Cuba is a place to see something completely different. Do not expect Las Vegas standards. Do not expect a high level of service. Do not ask for king size beds at all accommodations. If you're looking for luxury, there are loads of better destinations. If you are looking for old world charm and to see something very different, there are no better destinations close to the USA than Cuba. - If flying with scheduled airlines from the U.S., airlines usually sell the tourist card together with the ticket OR close to the departure gate of your Cuba bound flight. - If flying direct with a charter, the charter company issues your tourist card. - If flying via Canada, the tourist card is handed out either at check-in or on board the plane and is included in the ticket price. - If flying via any Central American or Caribbean gateway the tourist card is purchased at the counter or near it. This goes for most South Americans departure points as well. - If flying via Europe, Asia, Australia etc. the most common way of obtaining the tourist card is via the local embassy or consulate. 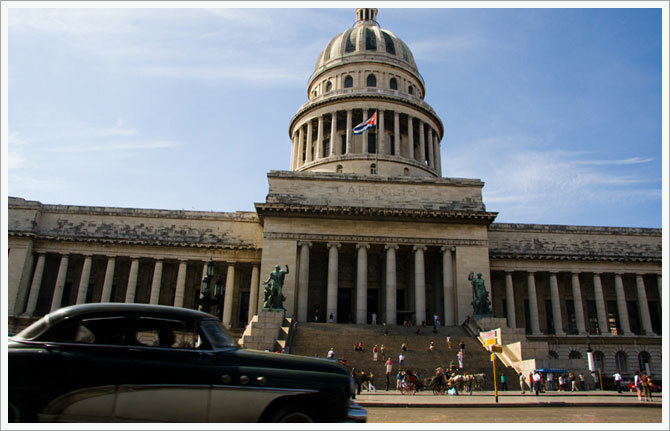 We are more than happy to assist U.S. citizens in arranging a trip to Havana or a tour around Cuba. Send us an e-mail and we can work out everything according to your wishes for the perfect trip. "Cuba is amazing. It was like being in a movie set for 10 days. Yourowncuba made us a perfect itinerary and while I don't think it's normal in Cuba everything simply went like clockwork from the minute they picked us up at the airport. We spent 10 completely unforgetable days in Cuba and I hope I get the chance to go back. I also hope other Americans will treat Cuba with the respect it deserves. I hope Cuba stays special, also for Cubas sake. "We've been wanting to visit Cuba for years, but never went because of the embargo. As it seems the embargo might outlive us, we finally got in contact with yourowncuba and they arranged everything. We had a full itinerary made out, were picked up at the airport, spent two weeks in this amazing country and came home with no issues, no stamps in our passports, no questions asked by anybody, but with two suitcases full of amazing memories." "Thanks you guys for an unforgetable trip to Cuba. I can't believe there's a world like that right on the doorsteps of the U.S. I had a fabulous time there and can't thank you enough for arranging everything. Even though I used a variety of your services and had you guys arrange it all, I am sure everything would have been 10 times as expensive booking it all myself. I loved the photo tour of Havana, what an astonishing city to take photos in. I'll go back within the next 2-3 years for sure, and will definitely contact you again next time."